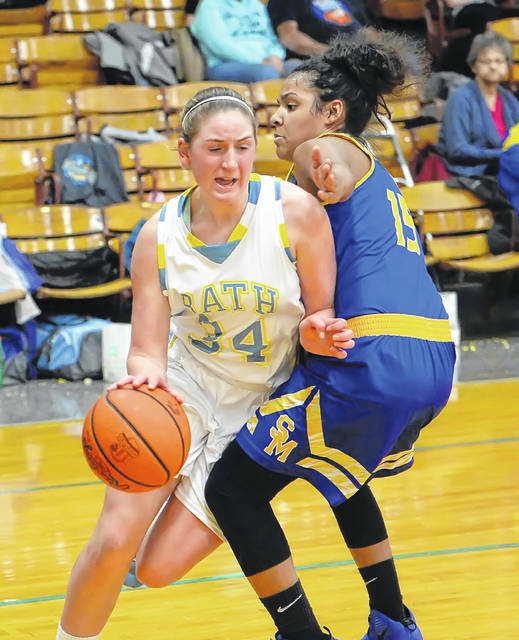 Bath’s Madelyn Renner drives against St. Marys’ Noelle Ruane during Thursday night’s Western Buckeye League game at Bath. 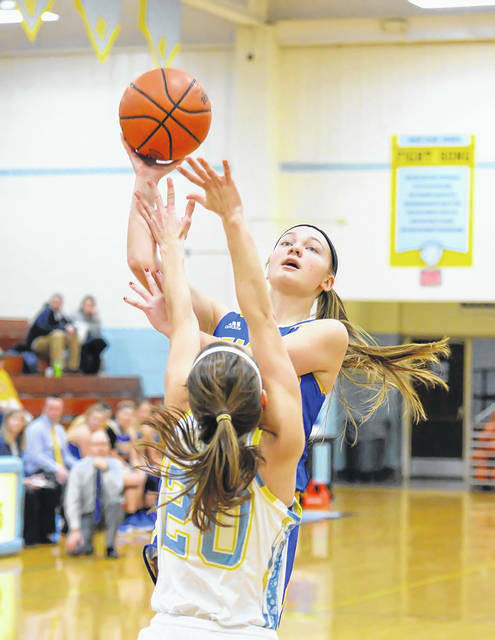 Ally Will of St. Marys puts up a shot against Bath’s Tori Dackin during Thursday night’s Western Buckeye League game at Bath. Bath’s Ruby Bolon defends against St. Marys’ Lauren Cisco during Thursday night’s Western Buckeye League game at Bath. St. Marys’ Noelle Ruane defends against Bath’s Chandler Clark during Thursday night’s Western Buckeye League game at Bath. BATH TOWNSHIP — Longtime Bath girls basketball coach Greg Mauk was feeling confident down the stretch in Thursday’s key Western Buckeye League game against visiting St. Marys. With 2.3 seconds left to play in overtime and the game knotted at 44 apiece, Bath’s Chandler Clark put herself on the free throw line after being fouled on a strong drive to the basket. Clark missed the first free throw attempt. Then on the second free throw attempt, the ball bounced off the rim again. However, teammate Ruby Bolon came away with the rebound and went back up strong to score the game-winning shot, to give Bath the hard-fought 46-44 victory over the Roughriders. With the win, Bath improves to 8-9 overall and 5-2 in the WBL. St. Marys, which has won eight of its last 10 games, slips to 9-9 overall and 4-3 in league play. Both teams came into Thursday’s contest tied for third place in the WBL. “I thought for sure she (Clark) was going to bury them (the free throws),” Mauk said. “If I had to put somebody up there right now, I’d still put her up there. Clark led Bath with 12 points, including two 3-pointers. Clark also had four assists. Madelyn Renner scored 10 points and pulled down six boards. Kaleigh Ketcham had eight points, four rebounds and three steals. Ruby Bolon had eight points, including the game-winner for the Wildkittens. 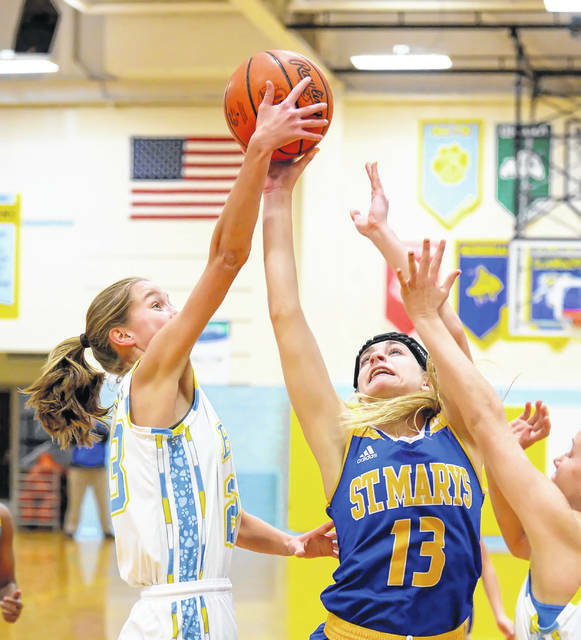 Kendall Dieringer led St. Marys with 14 points. Lauren Cisco scored 10 points, including two 3-pointers for the Roughriders. After the game was knotted twice early on, Bath pulled out to a 10-6 lead by the end of the first quarter. St. Marys made just 3 of 10 shots from the floor. Bath connected twice behind the arc in the first eight minutes. Ketcham and Renner each had a 3-pointer for the Wildkittens. The Roughriders came roaring back in the second quarter, knotting the game three times, and briefly reclaiming the lead. However, a 3-pointer by Clark right at the buzzer gave the Wildkittens a 21-20 lead, heading into the halftime break. Clark scored nine points in the first half. St. Marys shot well in the second stanza, hitting 6 of 10 from the floor. Dieringer led the Roughriders with six first-half points. Bath slipped out with a 30-29 lead by the end of the third quarter. In the final eight minutes of regulation, the lead changed hands six times, before Bath’s Ja’Dasia Hardison (four points) nailed a 3-pointer to knot the game at 40 apiece. However, with 9.7 seconds left in regulation, St. Marys had another opportunity. 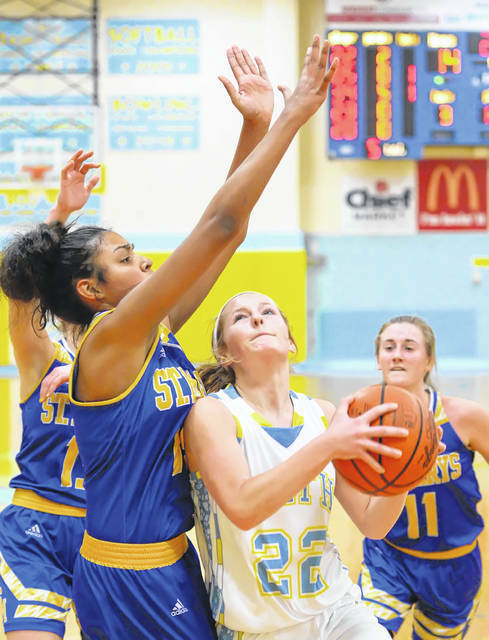 St. Marys’ Noelle Ruane (four points) had two free throw attempts. Ruane missed both, which eventually led to the four-minute extra session. After two lead changes in the overtime period, Ketcham went to the free throw line to shoot two. Ketcham made one, knotting the game at 44 each. St. Marys turned the ball over on its ensuing possession. Bath had the basketball with 21.8 seconds left in overtime. The Wildkittens were looking for the last shot. That’s when Clark’s drive to the basket set up the game-winning put back by Bolon off the missed free throw by Clark. “I thought the whole game, our kids defended really well,” Mauk said. “That’s the best defensive game we’ve played so far. We had a hard time getting some shots to fall for us, though. I thought we had really good looks. We just didn’t make many of those shots. For the game, Bath shot 38 percent from the field. St. Marys shot 42 percent. Bath turned the ball over 14 times, while St. Marys turned it over 15 times. The Roughriders held the edge on the boards, 33-28. This entry was tagged bath, stmarys. Bookmark the permalink.